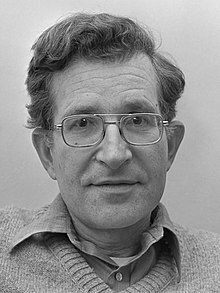 Date of birth Dec 07, 1928 East Oak Lane, Pennsylvania, U.S.A.
Residence Lexington, Middlesex County, Massachusetts, U.S.A.
Avram Noam Chomsky (US: a-VRAHM NOHM CHOM-skee; born December 7, 1928) is an American linguist, philosopher, cognitive scientist, historian, social critic, and political activist. Sometimes described as "the father of modern linguistics," Chomsky is also a major figure in analytic philosophy and one of the founders of the field of cognitive science. He is the author of over 100 books on topics such as linguistics, war, politics, and mass media. Ideologically, he aligns with anarcho-syndicalism and libertarian socialism. Until 2017, he was Institute Professor Emeritus at the Massachusetts Institute of Technology (MIT), where he had worked since 1955. In August 2017 he was appointed laureate professor at the University of Arizona, where he will chair a program in environmental and social justice. Born to middle-class Ashkenazi Jewish immigrants in Philadelphia, Chomsky developed an early interest in anarchism from alternative bookstores in New York City. 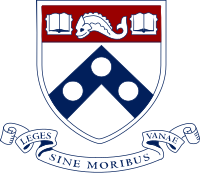 At the age of 16 he began studies at the University of Pennsylvania, taking courses in linguistics, mathematics, and philosophy. From 1951 to 1955 he was appointed to Harvard University's Society of Fellows, where he developed the theory of transformational grammar for which he was awarded his doctorate in 1955. That year he began teaching at MIT, in 1957 emerging as a significant figure in the field of linguistics for his landmark work Syntactic Structures, which remodeled the scientific study of language, while from 1958 to 1959 he was a National Science Foundation fellow at the Institute for Advanced Study. He is credited as the creator or co-creator of the universal grammar theory, the generative grammar theory, the Chomsky hierarchy, and the minimalist program. Chomsky also played a pivotal role in the decline of behaviorism, being particularly critical of the work of B. F. Skinner. An outspoken opponent of U.S. involvement in the Vietnam War, which he saw as an act of American imperialism, in 1967 Chomsky attracted widespread public attention for his anti-war essay "The Responsibility of Intellectuals". Associated with the New Left, he was arrested multiple times for his activism and placed on President Richard Nixon's Enemies List. While expanding his work in linguistics over subsequent decades, he also became involved in the Linguistics Wars. In collaboration with Edward S. Herman, Chomsky later co-wrote an analysis articulating the propaganda model of media criticism, and worked to expose the Indonesian occupation of East Timor. However, his defense of unconditional freedom of speech – including for Holocaust deniers – generated significant controversy in the Faurisson affair of the early 1980s. Following his retirement from active teaching, he has continued his vocal political activism, including opposing the War on Terror and supporting the Occupy movement. What motivated his [political] interests? A powerful curiosity, exposure to divergent opinions, and an unorthodox education have all been given as answers to this question. He was clearly struck by the obvious contradictions between his own readings and mainstream press reports. The measurement of the distance between the realities presented by these two sources, and the evaluation of why such a gap exists, remained a passion for Chomsky. Chomsky's primary education was at Oak Lane Country Day School, an independent Deweyite institution that focused on allowing its pupils to pursue their own interests in a non-competitive atmosphere. It was here, at the age of 10, that he wrote his first article, on the spread of fascism, following the fall of Barcelona to Francisco Franco's fascist army in the Spanish Civil War. At the age of 12, Chomsky moved on to secondary education at Central High School, where he joined various clubs and societies and excelled academically, but was troubled by the hierarchical and regimented method of teaching used there. From the age of 12 or 13, he identified more fully with anarchist politics. The work of anarcho-syndicalist Rudolf Rocker (left) and democratic socialist George Orwell (right) significantly influenced the young Chomsky. In 1947, Chomsky entered into a romantic relationship with Carol Doris Schatz, whom he had known since they were toddlers, and they married in 1949. After Chomsky was made a Fellow at Harvard, the couple moved to an apartment in the Allston area of Boston, remaining there until 1965, when they relocated to the city's Lexington area. In 1953 the couple took up a Harvard travel grant in order to visit Europe, traveling from England through France and Switzerland and into Italy. On that same trip they also spent six weeks at Hashomer Hatzair's HaZore'a kibbutz in the newly established Israel; although enjoying himself, Chomsky was appalled by the Jewish nationalism and anti-Arab racism that he encountered in the country, as well as the pro-Stalinist trend that he thought pervaded the kibbutz's leftist community. Chomsky had befriended two linguists at the Massachusetts Institute of Technology (MIT), Morris Halle and Roman Jakobson, the latter of whom secured him an assistant professor position at MIT in 1955. There Chomsky spent half his time on a mechanical translation project, and the other half teaching a course on linguistics and philosophy. He later described MIT as "a pretty free and open place, open to experimentation and without rigid requirements. It was just perfect for someone of my idiosyncratic interests and work." In 1957 MIT promoted him to the position of associate professor, and from 1957 to 1958 he was also employed by Columbia University as a visiting professor. That same year, Chomsky's first child, a daughter named Aviva, was born, and he published his first book on linguistics, Syntactic Structures, a work that radically opposed the dominant Harris–Bloomfield trend in the field. The response to Chomsky's ideas ranged from indifference to hostility, and his work proved divisive and caused "significant upheaval" in the discipline. Linguist John Lyons later asserted that it "revolutionized the scientific study of language". From 1958 to 1959 Chomsky was a National Science Foundation fellow at the Institute for Advanced Study in Princeton, New Jersey. In 1959 he published a review of B. F. Skinner's 1957 book Verbal Behavior in the journal Language, in which he argued against Skinner's view of language as learned behavior. Opining that Skinner ignored the role of human creativity in linguistics, his review helped him to become an "established intellectual", and he proceeded to found MIT's Graduate Program in linguistics with Halle. In 1961 he was awarded academic tenure, being made a full professor in the Department of Modern Languages and Linguistics. He went on to be appointed plenary speaker at the Ninth International Congress of Linguists, held in 1962 in Cambridge, Massachusetts, which established him as the de facto spokesperson of American linguistics. He continued to publish his linguistic ideas throughout the decade, including in Aspects of the Theory of Syntax (1966), Topics in the Theory of Generative Grammar (1966), and Cartesian Linguistics: A Chapter in the History of Rationalist Thought (1966). Along with Halle, he also edited the Studies in Language series of books for Harper and Row, and extended the theory of generative grammar to phonology in The Sound Pattern of English (1968). He continued to receive academic recognition and honors for his work, in 1966 visiting a variety of Californian institutions, first as the Linguistics Society of America Professor at the University of California, and then as the Beckman Professor at the University of California, Berkeley. His Beckman lectures would be assembled and published as Language and Mind in 1968. The ensuing debates between Chomsky and his critics came to be known as the "Linguistics Wars", although they revolved largely around debating philosophical issues rather than linguistics proper. [I]t does not require very far-reaching, specialized knowledge to perceive that the United States was invading South Vietnam. And, in fact, to take apart the system of illusions and deception which functions to prevent understanding of contemporary reality [is] not a task that requires extraordinary skill or understanding. It requires the kind of normal skepticism and willingness to apply one's analytical skills that almost all people have and that they can exercise. Along with his writings, Chomsky also became actively involved in left-wing activism. Refusing to pay half his taxes, he publicly supported students who refused the draft, and was arrested for being part of an anti-war teach-in outside the Pentagon. During this time, Chomsky, along with Mitchell Goodman, Denise Levertov, William Sloane Coffin, and Dwight Macdonald, also founded the anti-war collective RESIST. Although he questioned the objectives of the 1968 student protests, he gave many lectures to student activist groups; furthermore, he and his colleague Louis Kampf began running undergraduate courses on politics at MIT, independently of the conservative-dominated political science department. During this period, MIT's various departments were researching helicopters, smart bombs and counterinsurgency techniques for the war in Vietnam and, as Chomsky says, "a good deal of [nuclear] missile guidance technology was developed right on the MIT campus". As Chomsky elaborates, "[MIT was] about 90% Pentagon funded at that time. And I personally was right in the middle of it. I was in a military lab ... the Research Laboratory for Electronics." By 1969, student activists were actively campaigning "to stop the war research" at MIT. Chomsky was sympathetic to the students but he also thought it best to keep such research on campus and he proposed that it should be restricted to what he called "systems of a purely defensive and deterrent character". During this period, MIT had six of its anti-war student activists sentenced to prison terms. Chomsky says MIT's students suffered things that "should not have happened", though he has also described MIT as "the freest and the most honest and has the best relations between faculty and students than at any other ... [with] quite a good record on civil liberties". In 1970 he visited the Vietnamese city of Hanoi to give a lecture at the Hanoi University of Science and Technology; on this trip he also toured Laos to visit the refugee camps created by the war, and in 1973 he was among those leading a committee to commemorate the fiftieth anniversary of the War Resisters League. President Richard Nixon placed Chomsky on his 'Enemies List'. Throughout the late 1970s and 1980s, Chomsky's publications expanded and clarified his earlier work, addressing his critics and updating his grammatical theory. His public talks often generated considerable controversy, particularly when he criticized actions of the Israeli government and military, and his political views came under attack from right-wing and centrist figures, the most prominent of whom was Alan Dershowitz. Chomsky considered Dershowitz "a complete liar" and accused him of actively misrepresenting his position on issues. Furthermore, during the early 1970s he had begun collaborating with Edward S. Herman, who had also published critiques of the U.S. war in Vietnam. Together they authored Counter-Revolutionary Violence: Bloodbaths in Fact & Propaganda, a book which criticized U.S. military involvement in Southeast Asia and highlighted how mainstream media neglected to cover stories about these activities; the publisher Warner Modular initially accepted it, and it was published in 1973. However, Warner Modular's parent company, Warner Communications, disapproved of the book's contents and ordered all copies to be destroyed. While mainstream publishing options proved elusive, Chomsky found support from Michael Albert's South End Press, an activist-oriented publishing company. In 1979, Chomsky and Herman revised Counter-Revolutionary Violence and published it with South End Press as the two-volume The Political Economy of Human Rights. In this they compared U.S. media reactions to the Cambodian genocide and the Indonesian occupation of East Timor. They argued that because Indonesia was a U.S. ally, U.S. media ignored the East Timorese situation while focusing on that in Cambodia, a U.S. enemy. Taking a particular interest in the situation in East Timor, Chomsky testified on the subject in front of the United Nations' Special Committee on Decolonization in both 1978 and 1979, and attended a conference on the occupation held in Lisbon in 1979. The following year, Steven Lukas authored an article for the Times Higher Education Supplement accusing Chomsky of betraying his anarchist ideals and acting as an apologist for Cambodian leader Pol Pot. Although Laura J. Summers and Robin Woodsworth Carlsen replied to the article, arguing that Lukas completely misunderstood Chomsky and Herman's work, Chomsky himself did not. The controversy damaged his reputation, and Chomsky maintains that his critics deliberately printed lies about him in order to defame him. Although Chomsky had long publicly criticized Nazism and totalitarianism more generally, his commitment to freedom of speech led him to defend the right of French historian Robert Faurisson to advocate a position widely characterized as Holocaust denial. Without Chomsky's knowledge, his plea for the historian's freedom of speech was published as the preface to Faurisson's 1980 book Mémoire en défense contre ceux qui m'accusent de falsifier l'histoire. Chomsky was widely condemned for defending Faurisson, and France's mainstream press accused Chomsky of being a Holocaust denier himself, refusing to publish his rebuttals to their accusations. Critiquing Chomsky's position, sociologist Werner Cohn later published an analysis of the affair titled Partners in Hate: Noam Chomsky and the Holocaust Deniers. The Faurisson affair had a lasting, damaging effect on Chomsky's career, and Chomsky did not visit France, where the translation of his political writings was delayed until the 2000s, for almost thirty years following the affair. In 1988, Chomsky and Herman published Manufacturing Consent: The Political Economy of the Mass Media, in which they outlined their propaganda model for understanding the mainstream media; there they argued that even in countries without official censorship, the news provided was censored through four filters which had a great impact on what stories are reported and how they are presented. The book was adapted into a 1992 film, Manufacturing Consent: Noam Chomsky and the Media, which was directed by Mark Achbar and Peter Wintonick. In 1989, Chomsky published Necessary Illusions: Thought Control in Democratic Societies, in which he critiqued what he sees as the pseudo-democratic nature of Western capitalist states. In the 1990s, Chomsky embraced political activism to a greater degree than before. Retaining his commitment to the cause of East Timorese independence, in 1995 he visited Australia to talk on the issue at the behest of the East Timorese Relief Association and the National Council for East Timorese Resistance. The lectures that he gave on the subject would be published as Powers and Prospects in 1996. As a result of the international publicity generated by Chomsky, his biographer Wolfgang Sperlich opined that he did more to aid the cause of East Timorese independence than anyone but the investigative journalist John Pilger. After East Timor's independence from Indonesia was achieved in 1999, the Australian-led International Force for East Timor arrived as a peacekeeping force; Chomsky was critical of this, believing that it was designed to secure Australian access to East Timor's oil and gas reserves under the Timor Gap Treaty. 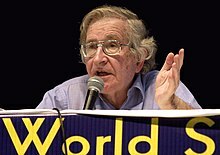 In early 2016, Chomsky was publicly rebuked by President Recep Tayyip Erdoğan of Turkey after he signed an open letter condemning the Turkish leader for his anti-Kurdish repression and supporting terrorism. Chomsky accused Erdoğan of hypocrisy and added that the Turkish president supports al-Qaeda's Syrian affiliate, the al-Nusra Front. Chomsky also criticized the U.S.'s close ties with Saudi Arabia and U.S. involvement in Saudi Arabian-led intervention in Yemen, highlighting that Saudi has "one of the most grotesque human rights records in the world". What started as purely linguistic research ... has led, through involvement in political causes and an identification with an older philosophic tradition, to no less than an attempt to formulate an overall theory of man. The roots of this are manifest in the linguistic theory ... The discovery of cognitive structures common to the human race but only to humans (species specific), leads quite easily to thinking of unalienable human attributes. Within the field of linguistics, McGilvray credits Chomsky with inaugurating the "cognitive revolution". McGilvray also credits him with establishing the field as a formal, natural science, moving it away from the procedural form of structural linguistics that was dominant during the mid-20th century. As such, some have called him "the father of modern linguistics". Since the 1960s, Chomsky has maintained that syntactic knowledge is at least partially inborn, implying that children need only learn certain parochial features of their native languages. Chomsky based his argument on observations about human language acquisition, noting that there is an enormous gap between the linguistic stimuli to which children are exposed and the rich linguistic knowledge they attain (see: "poverty of the stimulus" argument). For example, although children are exposed to only a finite subset of the allowable syntactic variants within their first language, they somehow acquire the ability to understand and produce an infinite number of sentences, including ones that have never before been uttered. To explain this, Chomsky reasoned that the primary linguistic data (PLD) must be supplemented by an innate linguistic capacity. Furthermore, while a human baby and a kitten are both capable of inductive reasoning, if they are exposed to exactly the same linguistic data, the human will always acquire the ability to understand and produce language, while the kitten will never acquire either ability. Chomsky labeled whatever relevant capacity the human has that the cat lacks as the language acquisition device (LAD), and he suggested that one of the tasks for linguistics should be to determine what the LAD is and what constraints it imposes on the range of possible human languages. The universal features that would result from these constraints constitute "universal grammar". [Chomsky's] vision of a complex universe within the mind, governed by myriad rules and prohibitions and yet infinite in its creative potential, opens up vistas possibly as important as Einstein's theories. Since the 1990s, much of Chomsky's research has focused on what he calls the Minimalist Program (MP), in which he departs from much of his past research and instead attempts to simplify language into a system that relates meaning and sound using the minimum possible faculties that could be expected, given certain external conditions that are imposed on us independently. Chomsky dispenses with concepts such as 'deep structure' and 'surface structure' and instead places emphasis on the plasticity of the brain's neural circuits, along with which comes an infinite number of concepts, or 'Logical Forms'. When exposed to linguistic data, the brain of a hearer-speaker then proceeds to associate sound and meaning, and the rules of grammar that we observe are in fact only the consequences, or side effects, of the way that language works. Thus, while much of Chomsky's prior research has focused on the rules of language, he now focuses on the mechanisms that the brain uses to create these rules. The second major area to which Chomsky has contributed—and surely the best known in terms of the number of people in his audience and the ease of understanding what he writes and says—is his work on sociopolitical analysis; political, social, and economic history; and critical assessment of current political circumstance. In Chomsky's view, although those in power might—and do—try to obscure their intentions and to defend their actions in ways that make them acceptable to citizens, it is easy for anyone who is willing to be critical and consider the facts to discern what they are up to. Chomsky's political views have changed little since his childhood, when he was influenced by the emphasis on political activism that was ingrained in Jewish working-class tradition. He usually identifies as an anarcho-syndicalist or a libertarian socialist. He views these positions not as precise political theories but as ideals that he thinks best meet the needs of humans: liberty, community, and freedom of association. Unlike some other socialists, such as those who accept Marxism, Chomsky believes that politics lies outside the remit of science; however, he still roots his ideas about an ideal society in empirical data and empirically justified theories. Chomsky has been a prominent critic of U.S. imperialism. His published work has focused heavily on criticizing the actions of the United States. Chomsky believes that the basic principle of the foreign policy of the United States is the establishment of "open societies" that are economically and politically controlled by the U.S. and where U.S.-based businesses can prosper. He argues that the U.S. seeks to suppress any movements within these countries that are not compliant with U.S. interests and ensure that U.S.-friendly governments are placed in power. When discussing current events, he emphasizes their place within a wider historical perspective. He believes that official, sanctioned historical accounts of U.S. and British imperialism have consistently whitewashed these nations' actions in order to present them as having benevolent motives in either spreading democracy or, in older instances, spreading Christianity; criticizing these accounts, he seeks to correct them. Prominent examples that he regularly cites are the actions of the British Empire in India and Africa, and the actions of the U.S. in Vietnam, the Philippines, Latin America, and the Middle East. He has been critical of U.S. involvement in the Israel–Palestine conflict, arguing that it has consistently blocked a peaceful settlement. Chomsky has long endorsed the left binationalist program, seeking to create a democratic state in the Levant that is home to both Jews and Arabs. However, acknowledging the realpolitik of the situation, Chomsky has also considered a two-state solution on the condition that both nation-states exist on equal terms. As a result of his criticisms of Israel, Chomsky was barred from entering Israel in 2010. Socialism will be achieved only insofar as all social institutions—in particular, the central industrial, commercial, and financial institutions of a modern society—are placed under democratic control in a federal industrial republic of the sort that Russell and others envisioned, with actively functioning workers' councils and other self-governing units in which each citizen, in Thomas Jefferson's words, will be "a direct participator in the government of affairs." Chomsky deems libertarian socialist and anarcho-syndicalist ideas to be the inheritors of the classical liberal ideas of the Age of Enlightenment, arguing that his ideological position revolves around "nourishing the libertarian and creative character of the human being." He envisions an anarcho-syndicalist future in which there is direct worker control of the means of production, with society governed by workers' councils, who would select representatives to meet together at general assemblies. In this, he believes that there will be no need for political parties. By controlling their productive life, he believes that individuals can gain job satisfaction, a sense of fulfillment, and purpose to their work. He argues that unpleasant and unpopular jobs could be fully automated, carried out by workers who are specially remunerated, or shared among everyone. Chomsky's political writings have largely been focused on the two concepts of ideology and power, or the media and state policy. One of Chomsky's best-known works, Manufacturing Consent, dissects the media's role in reinforcing and acquiescing to state policies, across the political spectrum, while marginalizing contrary perspectives. Chomsky claims that this 'free-market' version of censorship is more subtle and difficult to undermine than the equivalent propaganda system that was present in the Soviet Union. As he argues, the mainstream press is corporate owned and thus reflects corporate priorities and interests. Although acknowledging that many American journalists are dedicated and well-meaning, he argues that the choice of topics and issues featured in the mass media, the unquestioned premises on which that coverage rests, and the range of opinions that are expressed are all constrained to reinforce the state's ideology. He states that, although the mass media will criticize individual politicians and political parties, it will not undermine the wider state-corporate nexus of which it is a part. As evidence, he highlights that the U.S. mass media does not employ any socialist journalists or political commentators. He also points to examples of important news stories that have been ignored by U.S. mainstream media because reporting on them would reflect badly upon the U.S. state: For instance, it ignored the murder of Black Panther Fred Hampton with possible FBI involvement, the massacres perpetrated in Nicaragua by the U.S.-funded Contras, and the constant reporting on Israeli deaths while ignoring the far larger number of Palestinian deaths in the conflict between those two nations. To remedy this situation, Chomsky calls for grassroots democratic control and involvement of the media. Chomsky considers most conspiracy theories to be fruitless, distracting substitutes to thinking about policy formation in an institutional framework, where individual manipulation is secondary to broader social imperatives. He does not dismiss conspiracy theories outright, but he does consider them unproductive to challenging power in a substantial way. In response to the labeling of his own thoughts as "conspiracy theory", Chomsky has replied that it is very rational for the media to manipulate information in order to sell it, like any other business. He asks whether General Motors would be accused of conspiracy if they deliberately selected what they would use or discard to sell their product. Chomsky's intellectual life had been divided between his work in linguistics and his political activism, philosophy coming as a distant third. Nonetheless, his influence among analytic philosophers has been enormous ... he has persistently defended his views against all takers, engaging in important debates with many of the major figures in analytic philosophy throughout his career. Despite having been raised Jewish, Chomsky is currently non-religious, although he has expressed approval of forms of religion such as liberation theology. He is known for his "dry, laconic wit", and for the use of irony in his writings, and has attracted controversy for labeling established political and academic figures with terms like "corrupt", "fascist", and "fraudulent". Chomsky's colleague Steven Pinker has said that he "portrays people who disagree with him as stupid or evil, using withering scorn in his rhetoric", and that this contributes to the extreme reactions that he generates from his critics. Chomsky avoids attending academic conferences, including left-oriented ones such as the Socialist Scholars Conference, preferring to speak to activist groups or hold university seminars for mass audiences. Chomsky was married to Carol Doris Schatz (Chomsky) from 1949 until her death in 2008. They had three children together: Aviva (b. 1957), Diane (b. 1960), and Harry (b. 1967). In 2014, Chomsky married Valeria Wasserman. [Chomsky's] voice is heard in academia beyond linguistics and philosophy: from computer science to neuroscience, from anthropology to education, mathematics and literary criticism. If we include Chomsky's political activism then the boundaries become quite blurred, and it comes as no surprise that Chomsky is increasingly seen as enemy number one by those who inhabit that wide sphere of reactionary discourse and action. Linguist John Lyons remarked that within a few decades of publication, Chomskyan linguistics had become "the most dynamic and influential" school of thought in the field. By the 1970s, his work had also come to exert a considerable influence on philosophy, while a poll conducted by Minnesota State University found Syntactic Structures to be the single most important work in the field of cognitive science. In addition, his work in automata theory and the Chomsky hierarchy has become well known in computer science, and he is much cited within the field of computational linguistics. The 1984 Nobel Prize laureate in Medicine and Physiology, Niels Kaj Jerne, used Chomsky's generative model to explain the human immune system, equating "components of a generative grammar ... with various features of protein structures". The title of Jerne's Stockholm Nobel Lecture was "The Generative Grammar of the Immune System". His theory of generative grammar has also carried over into music theory and analysis. Despite their respect for his intellectual contribution, a number of linguists and philosophers have been very critical of Chomsky's approach to language. These critics include Christina Behme, Rudolph Botha, Vyvyan Evans, Daniel Everett, Chris Knight, Bruce Nevin and Michael Tomasello. Chomsky's approach to academic freedom has led him to give support to MIT academics whose actions he deplores. In 1969, when Chomsky heard that Walt Rostow, a major architect of the Vietnam war, wanted to return to work at MIT, Chomsky threatened "to protest publicly" if Rostow was "denied a position at MIT". Then, in 1989, when Pentagon adviser, John Deutch, wanted to be the President of MIT, Chomsky supported his candidacy. Later, when Deutch became head of the CIA, the New York Times quoted Chomsky as saying, "He has more honesty and integrity than anyone I've ever met .... If somebody's got to be running the C.I.A., I'm glad it's him." [Chomsky's] become the guru of the new anti-capitalist and Third World movements. They take his views very uncritically; it's part of the Seattle mood – whatever America does is wrong. He confronts orthodoxy but he's becoming a big simplifier. What he can't see is Third World and other regimes that are oppressive and not controlled by America. His criticism of Israel has led to him being accused of being a traitor to the Jewish people and an anti-Semite. Criticizing Chomsky's defense of the right of individuals to engage in Holocaust denial on the grounds that freedom of speech must be extended to all viewpoints, Werner Cohn accused Chomsky of being "the most important patron" of the Neo-Nazi movement, while the Anti-Defamation League (ADL) accused him of being a Holocaust denier himself. The ADL have been accused of monitoring Chomsky's activities, and have characterised him as a "dupe of intellectual pride so overweening that he is incapable of making distinctions between totalitarian and democratic societies, between oppressors and victims". In turn, Chomsky has claimed that the ADL is dominated by "Stalinist types" who oppose democracy in Israel. Alan Dershowitz considered Chomsky to be a "false prophet of the left", while Chomsky has accused Dershowitz of being on "a crazed jihad, dedicating much of his life to trying to destroy my reputation". In 2014, he was awarded the Neil and Saras Smith Medal for Linguistics by the British Academy: this medal is awarded for "for lifetime achievement in the scholarly study of linguistics". What's the good word on Noam Chomsky?